The animal cried piteously for hours as the farmer tried to figure out what to do. Finally, he decided the animal was old, and the well needed to be covered up anyway, so it just wasn’t worth it to retrieve the donkey. He invited his neighbours to come and help, so they all grabbed a shovel and began to shovel dirt into the well. As he felt the dirt falling on him, the donkey, being a donkey, kicked and kicked. When that didn’t seem to help, he brayed and brayed. Once the piles of dirt hit the donkey, the animal found renewed energy, and brayed even louder than he had before. The men turned their eyes from one another and pretended not to hear the donkey’s pleadings. The donkey kicked up a fuss and made a terrible commotion, but no one came to help. The donkey cried, but as he tired and began to understand the hopelessness of its situation, he began to give up, and got quiet, and then he realised something amazing was happening. A few shovel loads later, the farmer and neighbours finally looked down the well and was astonished at what they saw. The men were quite surprised to see the donkey, looking right straight at them. It was standing on top of all that dirt that had been dropped on it. Pretty soon, everyone was amazed as the donkey stepped up over the edge of the well and trotted off! This story of the donkey in the well is timeless, and has circulated for a while. Its message is timeless, as many of us have found ourselves stuck in a situation where we just didn’t know to get through. The metaphorical dirt was poured over our heads, and we got buried by the problems, or we shook the dirt to the ground and rise above the circumstances. We always have the choice to be victim or victor. So if it feels as if you are in that well with no chance of being freed, think of the donkey who refused to accept that his circumstances were beyond his control; he didn’t give up and he didn’t give in. Life is going to shovel dirt on you, all kinds of dirt. The trick to getting out of the well is to shake it off and take a step up. Each of our troubles is a stepping stone. We can get out of the deepest wells just by not giving up. Cora- this is the first time I’ve read/heard of this story and it really struck a chord. I love it! Brilliant lesson and story about life!!!!!!! 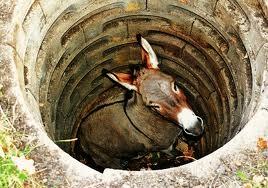 Why is that donkey LITERALLY in a well!!?? ?